Storefronts in high-traffic areas compete for customers constantly. What if there was a way to incentivize customer engagement in exchange for a simple commodity and basic information? What if the same platform could be employed to help spread free public Wi-Fi over remote locations? For this week’s #WebsiteWednesday, meet an innovative Wi-Fi management solution for retailers that’s been featured in TechInAsia, Dawn, and Lonely Planet, and tasked by the French Polynesian Government – Wifigen.xyz. Wifigen.xyz is a Pakistani startup that helps businesses build stronger relationships with their customers by providing free Wi-Fi in exchange for the permission to collect important information on their clients. After an undisclosed amount of funding from a Silicon Valley based investor that valued the company at $1 million, the initial product rollout took place in New Zealand, with future expansion slated for Australia and their native Pakistan. With their .xyz domain, Wifigen.xyz has no problem expanding their rollout worldwide. Companies using the Wifigen.xyz platform offer their customers free Wi-Fi as long as they log in with social profiles like Facebook and Twitter. This gives the company access to useful, non-invasive metrics like demographics, visiting frequency, and spending habits, as well as personalized profiles enhancing the customer relationship management process; visitors get free internet access and potential discounts. The French Polynesian government hopes this system and a new infrastructure overhaul will allow anyone to access the web from any of the hundreds of islands that make up the archipelago and revive tourism. This unique Wi-Fi solution has generated interest from Silicon Valley boardrooms to the New Zealand coasts. Wifigen.xyz’s success has even led the island nation of French Polynesia to reach out for innovative solutions to the small but mountainous country’s internet issues. For an entire country to trust a tech startup must mean their technology is the real deal and will soon make its presence known in America too. To stay on top of Wifigen.xyz’s expansion, make sure to connect with them through their XYZ branded social media on Facebook (/Wifigenxyz) or Twitter (@wifigen_xyz). For more .xyz users, follow XYZ on Instagram. 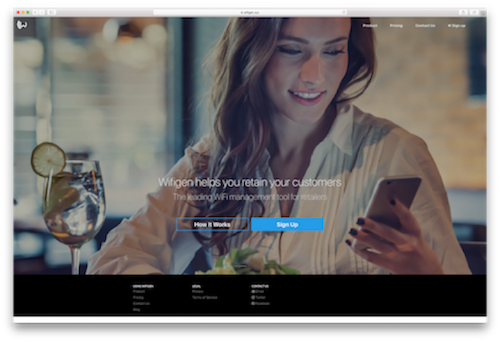 Drive customer engagement with Wifigen.xyz!